Christine Bryden is a well-known advocate of the rights of persons with dementia and one of the founders of Dementia Advocacy and Support Network International (DASNI). The book is a collection of 21 talks all delivered by Bryden between 2001 and 2014, with the exception of the first chapter, which is a talk given in 2001 with Morris Friedell, a co-founder of DASNI. Although the texts touch upon a variety of topics, they all revolve around a common nucleus of issues: identity, involvement, and stigma. They also share a similar structure, with Bryden oftentimes using her own story as a way of introducing the main issues, which are then addressed from a more general perspective. The starting point in her talks is the diagnosis: a life-changing moment that she compares to that of the sorcerer's act of pointing the bone ("the shock of the diagnosis"), through which the person is doomed to a life of desperation and isolation ("the horror of the prognosis"). To Bryden, diagnosis – the turning point when a person is thenceforth labelled as a "person with dementia" – is an act that bears potential violence. A potential that is all too often fulfilled: the person is suddenly stripped of both her individual identity and her social value. She becomes a victim and an outcast. Before the diagnosis she is a person and a valuable member of society (in Bryden's case, a high-ranking public officer for the Australian Government); after the diagnosis, she is deemed a "mindless empty shell" (p. 107) and a social liability. As such, diagnosis is both the source and reinforcement of stigma, which is a "disease of society, adding to our disability" (p. 111). A stigma which affects the private sphere, with the person seeing herself as a victim and retreating into isolation; the affective sphere, with family and friends becoming either "deniers" or "carers"; and the social sphere, with the person being judged as no longer having value because of her inability to contribute to society. 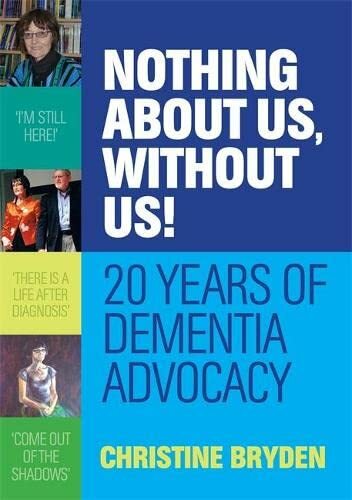 Based on her experience however, Bryden claims that the diagnosis shouldn't become the single defining moment in the life of a person with dementia: "the toxic lie of dementia, that the mind is absent and the body is an empty shell" (p. 77), inflicted through the diagnosis, can be overcome when the person with dementia refuses to be a victim and reframes herself as a survivor. Bryden asks: "Biology is not the sole determinant of my functions, not of my humanity. In what way has this damaged brain made me biologically inferior? In what way am I just a brain and not a whole person?" (p. 57). In the aftermath of an intimate catastrophic event, she argues that the primary task of the person with dementia should be to "try to move from being a victim to becoming a survivor" (p. 45), by facing the identity crisis, rejecting the reduction of her personhood to her biology, choosing a different identity as that of a survivor, and claiming a new role in society. A new path where the person with dementia takes a stand for meaning, quality of life, and respect; that is, she demands that her voice be heard and valued. It is precisely under this perspective, namely the use of her personal narrative as an instrument for collective claims, that Bryden's speeches stand as a valuable contribution to disability rights advocacy. Her texts fall within the category of nonfictional first-person narrative, whose importance has long been acknowledged in the fields of cultural studies and literary disability studies. More precisely, they can be understood as a variation of a specific type narrative first developed in Latin America called testimonio, which has played a significant role in "maintaining and developing the practice of international human rights and solidarity movements" (Beverly 1989, p. 19). Unlike other kinds of nonfictional first-person narrative such as autobiography, testimonio is "explicitly concerned with articulating a process of recognition and resistance of oppression" of a specific group (Irizarry 2005, p. 264). While autobiography, with the topos of the hero overcoming a negative condition, is tacitly grounded on "an ideology of individualism" (Beverly 1989, p. 23), testimonio focuses on "a problematic collective social situation that the narrator lives with or alongside others" (Beverly 1989, p. 15). Bryden was one of the first persons with dementia to deliver a plenary speech at a scientific/policy conference on dementia almost two decades ago. Back then she affirmed that persons with dementia be considered "as a person, first and foremost, not a disease" (Bryden 2005, p. 127). Since then this has been the core of her collective advocacy, made all the more poignant by the narration of her personal journey. The speeches collected in this book thus constitute a kind of disability testimonio revolving entirely around the motto of the disability rights movement "nothing about us, without us", as the title of the book itself shows. Claiming that persons with dementia "need you to acknowledge who we are, to listen to our emotion and pain, and to treat us as people of value and dignity, worthy of respect" (p. 60), Bryden calls for the active involvement of persons with dementia in Alzheimer's and dementia organisations so as to make their voices heard in the development of policies, programs, and services. Her claim is compelling: "it is unethical to collect and distribute funds for services on our behalf without regard for our dignity" (p. 69). Bryden's argument goes far beyond inclusion based on acknowledgement of personhood, respect of human dignity and of equal human rights. For Bryden, a person with dementia is "an expert in the lived experience of dementia" (p. 221), a person in the unique position of being "bicultural, bilingual, speaking and knowing the language and mores of normality as well as dementia. So we can bridge the gap between the world of normality and the world of dementia, and help you to understand us and our needs" (p. 48). For Bryden, the active involvement of persons with dementia is essential in order to avoid falling into the trap of paternalism. On a final note, in some of the talks in the book, when telling the story of the years immediately following her diagnosis, Bryden recalls how joining an email support group with and for persons with dementia played a pivotal role in her transition from victim to survivor. This adds some additional value to the book by making it a testimony of one of the early examples of the positive impact of information and communication technologies on the development of disability rights advocacy. Gian Maria Greco (MA and PhD in Philosophy; International MA in Accessibility to Media, Arts and Culture) is specialised in accessibility and human rights, with a focus on the media and the performing arts. He co-authored two books (in Italian): "Making as Healing Care. On the Constructionist Foundations of Occupational Therapy" (2013) and "Accessibility, Health and Safety of Live Events and Venues" (2015). He is one of the founding members of the Media Accessibility Platform. Currently, he is a member of the Advisory Board of the EU project "Accessible Culture and Training", and member of the scientific committee of the 5th ARSAD Conference.